This article is about the river. For the region, see Bagmati Zone. The Bagmati River[n 1] runs through the Kathmandu Valley of Nepal and separates Kathmandu from Patan. It is considered holy by both Hindus and Buddhists. A number of Hindu temples are located on its banks. The importance of Bagmati also lies in the fact that Hindus are cremated on the banks of this holy river, and Kirants are buried in the hills by its side. According to the Nepalese Hindu tradition, the dead body must be dipped three times into the Bagmati River before cremation, so that the reincarnation cycle may be ended. The chief mourner (usually the first son) who lights the funeral pyre must take a holy river-water bath immediately after cremation. Many relatives who join the funeral procession also take a bath in the Bagmati River or sprinkle the holy water on their bodies at the end of cremation. The Bagmati River purifies the people spiritually. The Bagmati River is considered the source of Nepalese civilization and urbanization. The river has been mentioned as Vaggumuda (वग्गुमुदा) in Vinaya Pitaka and Nandabagga. It has also been mentioned as Bahumati (बाहुमति) in Battha Suttanta of Majjhima Nikaya. An inscription dated AD 477 describes the river as Bagvati parpradeshe (वाग्वति पारप्रदेशे) and subsequently in Gopalraj Vanshavali. The Chobar gorge cuts through the Mahabharat Range, also called the Lesser Himalaya. This 2,000-to-3,000-meter (6,600 to 9,800 ft) range is the southern limit of the "middle hills" across Nepal, an important cultural boundary between distinctive Nepali and more Indian cultures and languages, as well as a major geological feature. The basin of the Bagmati River, including the Kathmandu Valley, lies between the much larger Gandaki basin to the West and the Kosi Basin to the east. These adjacent basins extend north of the main Himalayan range and cross it in tremendous gorges, in fact, the Arun tributary of the Kosi extends far into Tibet. The smaller Bagmati rises some distance south of the Himalaya. Without glacial sources, its flow is more dependent on rainfall, becoming very low during the hot season (April to early June), then peaking during the monsoon season (mid-June to mid-August). In these respects, the Bagmati system resembles the (West) Rapti system lying between the Gandaki basin and the Karnali basin in the far west of Nepal. The Bagmati originates where three headwater streams converge at Bāghdwār (Nepali: बाघद्वार, "Tiger Gate"), where the water flows out through a gargoyle shaped like a tiger's mouth. This lies above the southern edge of the Shivapuri Hills about 15 kilometers (9 mi) northeast of Kathmandu. Here the Bagmati is wide and swift with a high load of suspended solids, giving it a grey appearance. The river flows southwest about 10 km (6 mi) through terraced rice fields in the Kathmandu Valley. Then the river bends south and the Vishnumati enters from the right at Teku Dovan. The Vishnumati also rises in the Shivapuri Hills, some 6 kilometers (4 mi) west of the Bagmati's source. It flows south past Nagarjun Hill and Forest Reserve, Swayambhu Stupa and Durbar Square in Kathmandu. As it passes the centre of Kathmandu, this tributary becomes heavily polluted and choked with trash. Bagmati River Irrigation Diversion at Sarlahi, Nepal. Flowing generally south although with many curves, the Bagmati reaches the edge of the Kathmandu Valley and enters Chobar Gorge near the Dakshinkali temple complex. The gorge cuts through the Mahabharat Range or Lesser Himalaya. The Bagmati also crosses the lower Sivalik Hills before reaching the Terai, then crosses into India at Dheng. It flows across Bihar districts Sitamarhi, Sheohar, Muzaffarpur and Khagaria. As it flows to Bihar the river is full with silt load and is notorious for changing its course and braids into many branches one of such branch joins Burhi Gandak river near Begusarai and the combined river drains into Ganga east of Begusarai while the main channel runs east to drain into Koshi at Badlaghat. However in past the river had a different course and used to drain directly into the Ganges. In Swasthani Bratakatha of Skanda Purana, Bagmati's present northern tributary was regarded as main channel called Sali river which was a tributary of the Gandak and it is obvious since Manohara river, the present day Sali river is larger than Bagmati at their confluence. The Bagmati River contains large amounts of untreated sewage, and large levels of pollution of the river exist due primarily to the region's large population. Many residents in Kathmandu empty personal garbage and waste into the river. In particular the Hanumante khola, Dhobi khola, Tukucha khola and Bishnumati khola are the most polluted. Attempts are being made to monitor the Bagmati River system and restore its cleanliness. These include "pollution loads modification, flow augmentation and placement of weirs at critical locations". In May 18, 2013, under the initiative of former chief secretary Leela mani Poudyal, The Bagmati Mega Clean Up Campaign was started. Every Saturday, Nepal Army, Nepal Police and General Public gather to clean the waste and sewage from the river. The Friends of the Bagmati is an organisation set up in November 2000. According to its website, its aim is "to reverse the degradation of the Bagmati river." In 2014, Bagmati River is claimed to be almost pure after a long effort of 14 years. There is no effect of flood in most of the areas that it touches, but it has caused widespread sufferings to the people in Terai and northern districts of Bihar. In 1993, people have seen the worst destruction by this river. Poor water management, lack of proper weather forecasting and awareness were the main cause of mass destruction. Gokarneshwor - Gokarneshwor Mahadev temple stands the banks of the Bagmati River, built in 1582. In late August or early September people go to this temple to bathe and make offerings in honor of their fathers, living or dead, on a day called Gokarna Aunsi also known as "Kushi Aausi" (worshipping for the eternal peace of Father). Guhyeshwari Temple - Guhyeshwari Temple, the Temple of Guhyeshwari lies about 1 km east of Pashupatinath Temple and is located near the banks of the Bagmati River. The temple name originates from the Sanskrit words Guhya (Secret) and Ishwari (Goddess). In Lalitha Sahasranama the 707th name of Goddess is mentioned as Guhyarupini (The form of Goddess is beyond human perception and it is secret. Another argument is that it is the secret 16th syllable of the Shodashi Mantra) (LS 137th verse: Sarasvati shastramayi| Guhaamba guhyaruupini||). It is believed that Sati Devi's corpse's parts fell in different region when Shiva took it and roamed around the world in sorrow. Temple of Pashupatinath - The Temple of Pashupatinath, dedicated to Shiva, stands on an outcrop above the river north of Kathmandu. It is considered to be one of the holy places of Hinduism. Koteshwor Mahadev - Koteshwor Mahadev temple at Koteshwor is also a major holy place located in bank of Bagmati River. According to a popular legend, the Shiva Lingam here is believed to be one of the 64 sacred Shiva Lingams. Shankhamul - Near the Koteshwor Mahadev Temple is a place known as Shankhamul. Shankhamul is one of the twelve “most-sacred” confluences in the Kathmandu valley as defined in the numerous chronicles that document the history and legends about the Kathmandu valley. At Shankhamul, the Bagmati River that flows south from the Pashupati temple complex, and all the rivers that flow from the eastern part of the valley including the Manohara River merge. Kalmochan Temple - Kalmochan temple, dedicated to the Hindu god Lord Vishnu the preserver, was a part of the Thapathali Durbar complex in bank of Bagmati River. It was built in early 18th century outside the walls. Built in Moghul Kathmandu-Gothic architecture style and has Mughal art and Nepali art. Also known as Janga Hiranya Hemnarayan mandir. It is located at kalmochan ghat in Thapathali. It was built by Rana prime minister Jung Bahadur Rana. Tripureshwor Temple - The temple of Tripureshwor Mahadev near the Kalmochan Ghat, is the largest temple in Kathmandu Valley, built by Lalit Tripura Sundari Devi in the nineteenth century (around 1875 B.S), it has three roofs—the upper two crafted of metal, while the bottom one is of baked terracota—and sits on a raised platform. The temple was made in the memory of her husband, King Rana Bahadur Shah for his eternal bliss and for the goodwill of her nation. It was probably the last major temple in the tiered style. Pachali Bhairav - It was the Thakuri king Gunakamadev (924–1008 A.D.) who established the worship of Pachali Bhairav . The god is very much associated with the founding of Kathmandu, because it was King Gunakamadev who is traditionally believed to have founded both the city and the festival of Bhairav which is located in the bank of Bagmati River. Teku Dovan - One of the 12 sacred Tirthas in the Kathmandu Valley. ghats are places for ritual bathing and cremation at or near rivers. Gyan Tirtha at the Confluence of Bagmati River and Bishnumati River. Sundhari Ghat - Sundhari Ghat is on the bank of Bagmati River before Chovar gorge. Jal Binayak Temple - Jal Binayak Temple is a Hindu Temple of Lord Ganesh located in the Chobhar, central part of Kathmandu District, Nepal. The Jal Binayak temple is the most important Ganesh shrine of the central region Kathmandu. It is one of the four Binayak of Kathmandu Valley. ^ Formerly also written Baghmati. ^ Kholā means "small river" or "creek" in Nepali. ^ Fisher, James F.; et al. (1997), Living Martyrs: Individuals and Revolution in Nepal, Oxford: Oxford University Press, p. 220, ISBN 0-19-564000-4 . ^ a b c d e f g h Davis (1977), p. 227. ^ Kannel & al. (2007), p. 505. ^ a b Kannel & al. (2007), p. 509. ^ Davis (1977), p. 229. ^ Kannel & al. (2007), p. 513. "Baghmati" , 'Encyclopædia Britannica, 9th ed., Encyclopædia Britannica, 9th ed. , New York: Charles Scribner's Sons, 1878, p. 235 . Davis, John A. 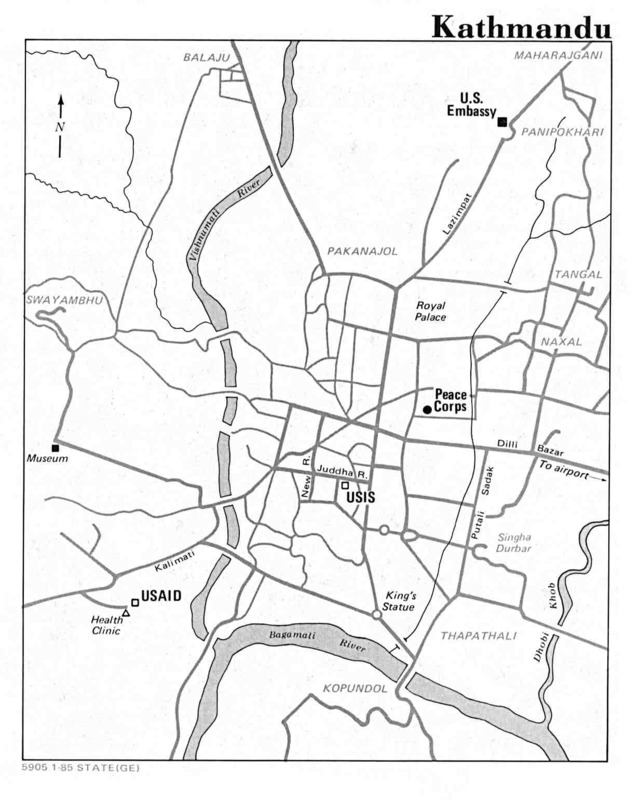 (1977), "Water Quality Standards for the Bagmati River", Journal of the Water Pollution Control Federation, Vol. 49, No. 2, pp. 227–234 . Kannel, Prakash Raj; et al. (10 April 2007), "Application of automated QUAL2Kw for water quality modeling and management in the Bagmati River, Nepal", Ecological Modelling, Vol. 202, No. 3-4, pp. 503–517, doi:10.1016/j.ecolmodel.2006.12.033 . Wikimedia Commons has media related to Bagmati river. This page was last edited on 7 March 2019, at 19:53 (UTC).